The DocuSign recruiting leadership team thought they were really crushing it a few years ago. “We were hitting our gross hiring targets, we ripped out old systems, put in new systems, we were leading with data, we were getting pats on the back from the business,” said Mike Euglow, then Head of Talent Acquisition (now leading recruiting at Stripe), in a talk at Talent Connect 2016 alongside Tony Truong, DocuSign’s Director of People Analytics. However, they were in for quite a surprise. It turns out that even though the company was happy with the way the recruiting team was working, the recruiting team itself was not. This painful realization came when Tony and Mike isolated recruiters’ responses to an employee engagement survey. 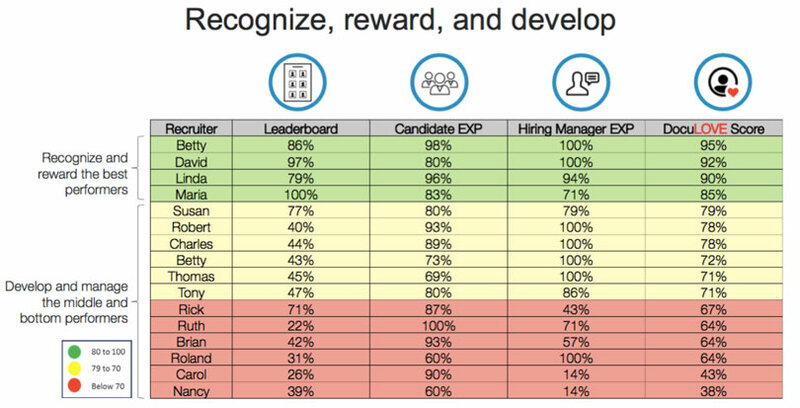 The results made it clear that the recruiting team felt ignored, scoring particularly low when it came to feedback, recognition, and development. “We were so focused in on hitting hiring targets and building the machines that we forgot about the most important thing: our people,” says Mike. The result? Low engagement. “People don’t work as hard. Productivity goes down. And guess what? They’re going to leave you; they’re going to go somewhere else. So we had to change,” shared Mike. To turn the ship around, DocuSign decided to show love to recruiters and motivate them in an unexpected way -- through using data. Even though love and data don’t always seem to go together, this approach worked incredibly well for the team, raising recruiter engagement by up to 24% and improving recruiter performance by 55%. Like ideal employees, recruiters want to get better at their jobs. Feedback, recognition, development: they wanted to hear how they are doing, get acknowledged for good work, and develop their skills. 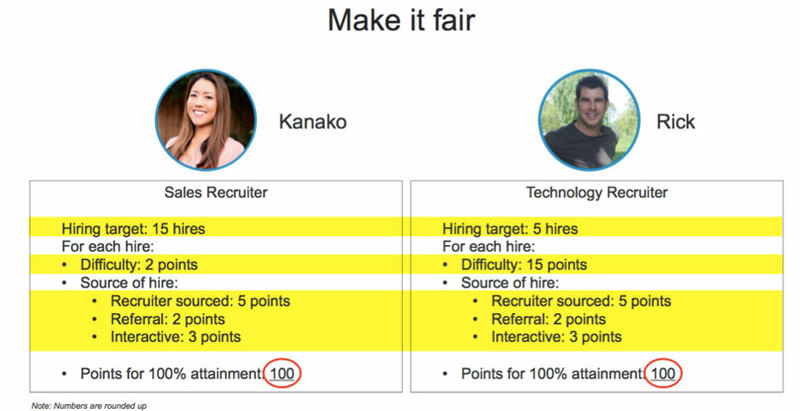 But before you can help recruiters get better, you have to decide what “better” means. Every company will have a different definition. For DocuSign, success boiled down to three things: delivering results, providing a great experience, and being a trusted partner to hiring managers. Once you’re clear on the elements of success, you need a concrete metric to measure each one. For results, DocuSign created an innovative leaderboard that recognized degrees of difficulty (more on that in a moment); for experience, they leveraged candidate experience surveys; for partnership, they used hiring manager experience surveys. Add them all together, and you get a recruiter’s DocuLove score. Tony and Mike stressed that this wasn’t about putting undue pressure on recruiters; no one was going to get fired for a low DocuLove score. Recruiters wanted more feedback, recognition, and development: DocuLove was designed as a tool to help provide specific feedback, recognize high performance, and identify skills to develop. 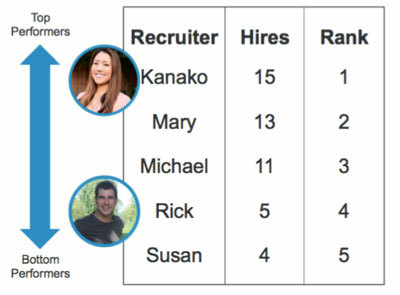 Some companies rank recruiters by a single metric, like hires placed. 15 hires is better than five, right? Sure, if every hire was interchangeable—but, of course, they’re not. Some positions require more skill, more time, and more tactics to fill. A single number papers over the different challenges that recruiters face. Using a single metric might be easy, but it’s also fundamentally unfair and inaccurate. Consider the case of these two recruiters, both knocking it out of the park. 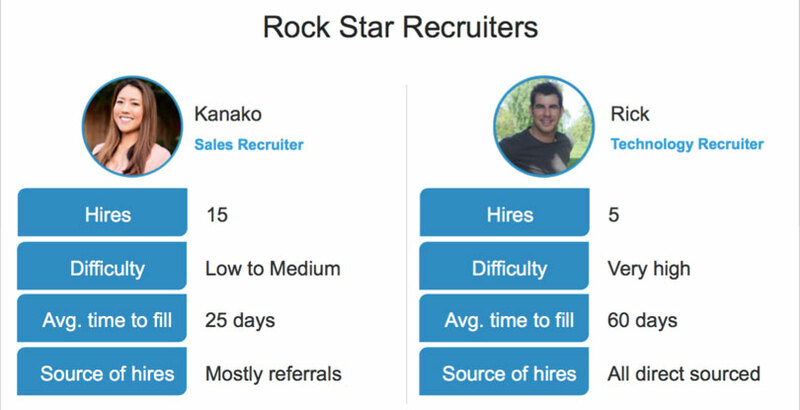 Kanako has made over a dozen hires in sales, mostly through referrals. 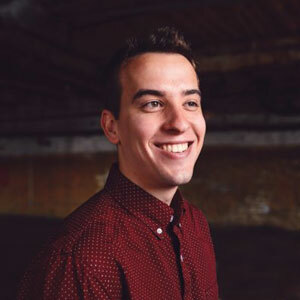 Rick has filled five hard-to-source tech positions, directly sourcing each one. If you limit yourself to hires, Rick looks like he’s underperforming—even though he’s got the hardest tasks. Recognizing this, DocuSign created a progressive point system that takes difficulty and sourcing methods into account. Now, both recruiters can get a clear-eyed view of their results—without papering over the nuances of their jobs. Hiring performance is only one third of the DocuLove score. The lion’s share comes from candidate and hiring manager experience. To quantify these admittedly subjective measures, DocuSign created standardized surveys for each audience. They sought responses from all candidates, not only those who received offers, asking how well the recruiter explained things (the company, the role, and the process), along with evaluating courtesies like follow-ups and respectfulness. 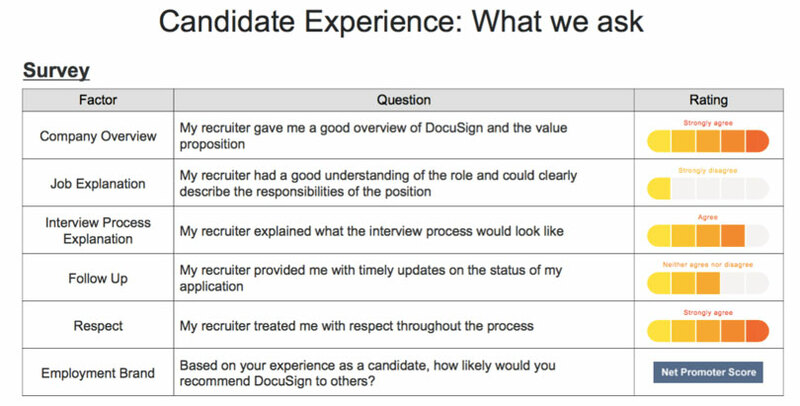 Finally, the survey asked how likely the candidate would be to recommend DocuSign to others based on their experience—a critical question that comprises a recruiter’s Net Promoter Score (NPS). When surveying hiring managers, DocuSign asked about the recruiter's’ ability to understand the role, follow-up properly, deliver quality candidates, screen out bad fits, and fill roles promptly, along with their overall impression of the process and satisfaction with the recruiter. While DocuSign singled out these criteria, your company may choose different metrics of experience. Ask yourselves what matters most to your business—how do you want candidates to feel about the process? What do your hiring managers need most from recruiters? Once you’ve got all this data, what’s the best way to give it back to your recruiters? DocuSign shares the results leaderboard weekly, highlighting the top five performers. Instead, individual recruiters receive a quarterly DocuLove scorecard. Whereas annual reviews can raise issues months after the damage is done and usually suffer from a recency bias, more frequent feedback encourages transparency and positive development. Furthermore, the detailed rankings—pictured below—are tightly guarded and used exclusively for development purposes. All this data wouldn’t mean much if it didn’t move the needle and actually elevate recruiters. 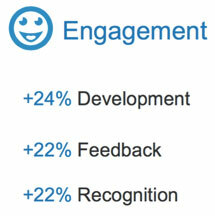 Fortunately, the recruiting team felt far more engaged: after one year with the new DocuLove system, employee scores on development, feedback, and recognition are all up by 22-24%. As it often does, higher performance followed greater engagement, with Candidate Net Promoter scores up more than 50% and significant improvements across candidate and hiring manager experience. Those stats are impressive, but it’s not what Mike and Tony are most proud of. Over the 12 months of the DocuLove program, not a single recruiter has left the team. That’s right: a 0% attrition rate. That’s one number that speaks for itself. The biggest takeaway for you and your leadership team? It might be just humility. Don’t assume you know everything: listen to what recruiters say they need. Then figure out how to support them with a systematic, fair-minded approach that uses data and analytics as a means to the ends of encouragement, empowerment, and, yes, love.